This is a review of the book "VIA Rail - A History of Canada's National Passenger Rail Service" by Christopher C.N. Greenlaw. I've been meaning to read this book for some time. I borrowed it from Winnipeg's excellent library system and devoured it over the course of a few days. 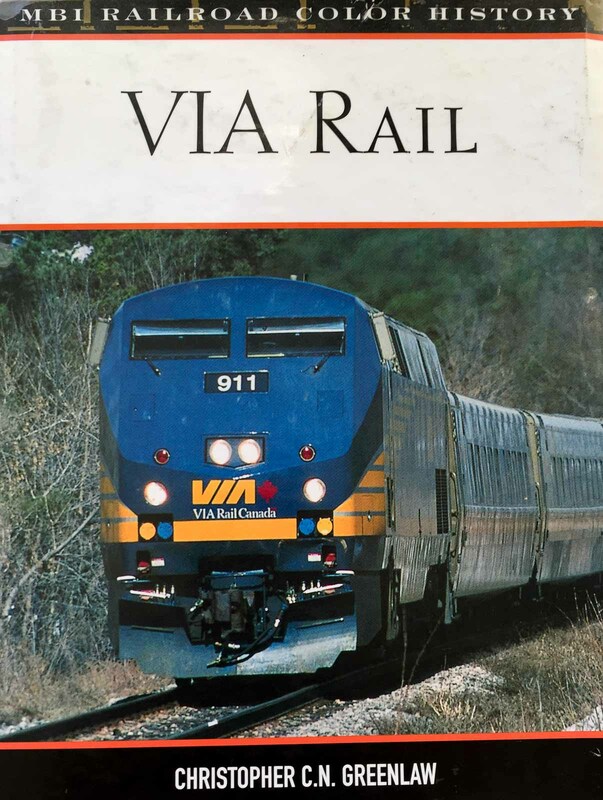 As the subtitle says, it is a history of VIA Rail. It's not a picture book. 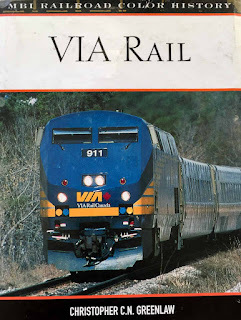 It's a scholarly and definitive look at the origins of VIA Rail, from the passenger services of CN and CP through the formation of VIA in the mid 1970s through to 2007, the publication date of the book. The book goes into detail on many of the decisions that were made by CN, CP and the federal government that led to the formation of VIA Rail, first as a "company within a company" in CN and then as a crown corporation. I knew the overall timeline already, but the book really delved into the reasoning and the political pressures and realities that led to the VIA we have today. One of the main problems with VIA Rail today, and indeed ever since it was founded, is that it is a political football, subject to the whims of the government in power. It was formed through a "back door" political maneuver (an Order in Council) rather than through a bill passed in Parliament. This has hamstrung VIA from the start and really prevents a lot of long-term planning, as VIA's funding is dependent on how the current government feels about passenger rail and other competing funding priorities. The book goes into a lot of detail on why this came about and why it continues to persist to this day. The book talks about the start of VIA, dealing with the passenger fleets of CN and CP for the first few years, and then talks about the devastating cuts of 1981 and 1990. The book is new enough to be able to talk about the Renaissance period at the turn of the century, but not new enough for the refurbishment of VIA's F40 and LRC fleet. The book has a multitude of photos illustrating VIA throughout the ages. As I said, it's not a picture book, but there are many photos and they complement the text very well. If you are a fan of passenger rail, or Canadian railways in general, you should read this book. It's one of the few books on VIA Rail and is well worth a read. You can buy it on Amazon or perhaps get it from your local library. My Amazon links in this post are affiliate links, meaning that I receive a small commission if you buy anything from Amazon after using this link, at no additional cost to you.